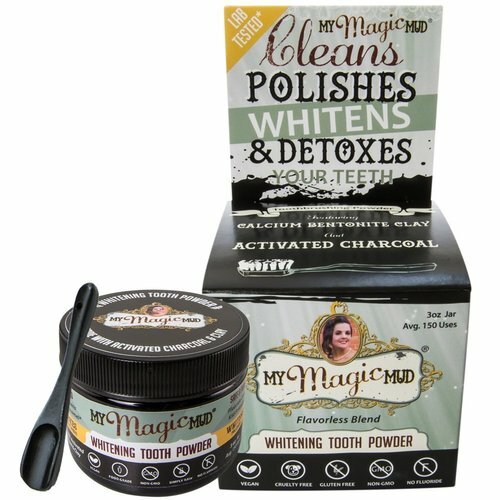 Detoxifying Tooth Powder from My Magic Mud is an alternative toothpaste option that is fluoride free featuring calcium bentonite clay and activated charcoal. 警告: My Magic Mud Tooth Powder includes activated coconut shell charcoal. This carbon-based tooth powder is very dark in color. Do not open this jar anywhere but over your sink. The contents can be very difficult to deal with if it accidentally gets into your carpet or onto your clothes. 注意事项: Paleo. Vegan. Gluten-Free. Never tested on animals. No fluoride. No Glycerin. No sodium lauryl phosphate. Ingredients: Activated Coconut Shell Charcoal, Calcium Bentonite Clay (Made with Living Clay), Certified Organic Orange Peel Extract Powder, Wildcrafted Mint Extract Powder. 推荐用法: Slowly open jar over sink. Tap your toothbrush bristles onto tooth powder. Use very little at a time! Seriously. A little goes a long way. Brush for 2 minutes. Brush gently. Don’t get overzealous. Nice and easy. The longer the mud is in your mouth, the more beneficial it is for teeth whitening and detoxification. Releasing the mud from your mouth can be accomplished in many, many, ways. That being said, here are two effective recommendations for spitting out the mud: Option 1: Bathroom Sink Gently let the “mud” fall out of your mouth and into your bathroom sink. Make sure the faucet water is running. To avoid a splatter in your sink, slowly spit the “mud” very close to drain. Option 2: Shower Hold My Magic Mud in your mouth after brushing and jump in the shower. The longer it stays in your mouth, the more beneficial it is for teeth whitening and detoxification. Go ahead and rinse this down the shower drain, with ease. Lastly, rinse your mouth with water, swoosh, spit, and continue until the mud residue has vanished from your teeth. Floss for added oral hygiene!